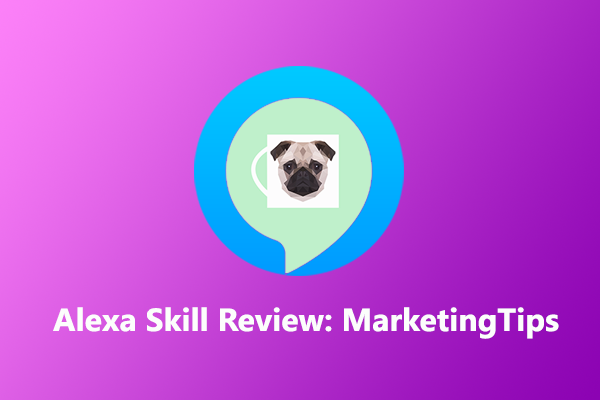 MarketingTips from Pug Mug Marketing is an Amazon Echo skill which helps provide users with digital marketing tips. It’s one of only 47 Business and Finance skills available on the Amazon store. To help provide daily inspiration to business owners or digital marketers looking to attract more visitors. MarketingTips is a useful skill which can help provide tips for web design, search engine optimisation and social media management. With the command ‘Alexa, launch marketing tips’, the amazon echo will play a random tip from the skills database. Now the tip might not be something that is relevant to you or your business, therefore you can ask for another tip with the same command. It’s a simple but effective app which could help give you inspiration to drive your online marketing. Even if it’s not something that helps, it could trigger off other ideas for you to start the day. For marketers stuck in a rut this could be a good source of ideas. It can also remind you to check in on areas that might have been neglected such as social media. Due to the lack other business skills that are available. This one is targeted towards business owners and marketers making it quite useful. With some more polishing such as multilevel responses it could become a really useful skill. If you’d like makeasmarterhome.com to review your skills or smart home products, get in touch today. ← Are Amazon winning the smart home voice assistant race?